Cook Islands Football Association (CIFA) achieved a major milestone on Monday 18 Sept 2017 after becoming the first member association in the region to launch the Oceania Football Confederation (OFC) Education Centre. The centre, part of the Oceania-wide programme, will provide each member association with an educational institute where participants will be able to learn and share their knowledge, skills and experience in football. The launching at the CIFA headquarters in Matavera was attended by the OFC president and FIFA senior vice-president David Chung, youth and sports minister Albert Nicholas, CIFA president Lee Harmon, OFC general secretary Tai Nicholas and the domestic club officials and players. 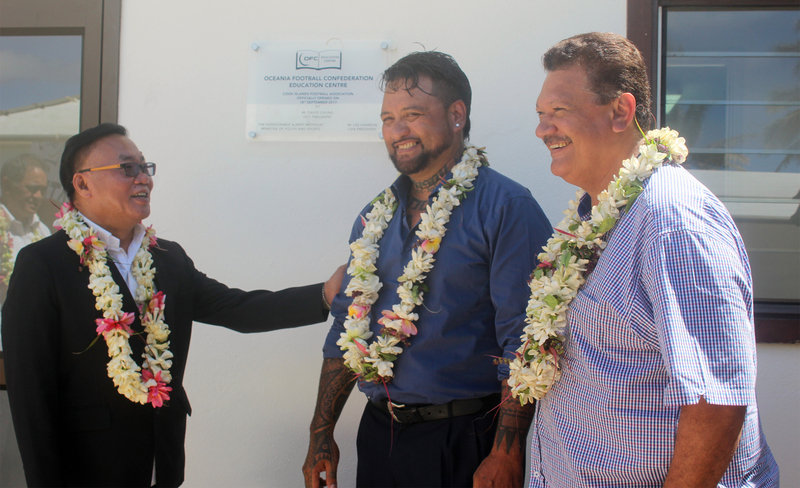 Harmon said they were proud that the Cook Islands was the first country in the Pacific to embrace and launch the OFC Education Centre programme. He congratulated Chung for the vision of setting up the centre throughout the various countries in the Pacific in a bid to improve the quality of football in the region. “Although we have conducted several coaching and refereeing courses here over the years at CIFA, this will now change with the OFC Education Centre and will branch off into other areas of sports such as administration, sports management, sports medicine and financial management,” Harmon said. “We will no longer be required to pay expensive airfares to travel overseas to educate our officials with the basic knowledge of the different areas of our game. Harmon thanked the OFC for choosing the Cook Islands to lead the way in this initiative. He also thanked the government through Minister Nicholas for their assistance in subsidising levy and tax on the imported football equipment and uniforms. Nicholas hailed FIFA and OFC for supporting the development of football in the region, including the Cook Islands. He said football here survived with passion of certain individuals during their time to become one of the popular sports in the country. “Everything has changed in leaps and bounds and I think it’s no secret that it has been part and parcel of the efforts of our president, Mr Lee Harmon,” Nicholas said. OFC president Chung said the education centre would be a foundation for development of football, both on the field and the administration level. This he hopes to achieve through the centre by providing structural pathways and qualifications for those interested in a career in football. He said the centre would be run similar to a college where participants will gain OFC recognised training and accreditation in a range of football topics. “At the end of the day, we need football to improve, both on and off the field. The OFC Education Centre will ensure participants in our member associations have access to quality education in football. This will no doubt improve the quality and quantity of football both here in the Cook Islands and the region,” Chung said. “I would like to thank CIFA president Lee Harmon, under your leadership and that of your management, football is well organised here. At the centre, the participants will receive OFC-recognised training in a range of football topics through a curriculum divided into four levels: Foundation courses, certification courses, licencing courses and refresher courses, and will gain regionally-recognised accreditation as they progress through the levels. The first refereeing course at the centre, which is open for anyone interested in football from volunteers to mums and dads, started on Monday.